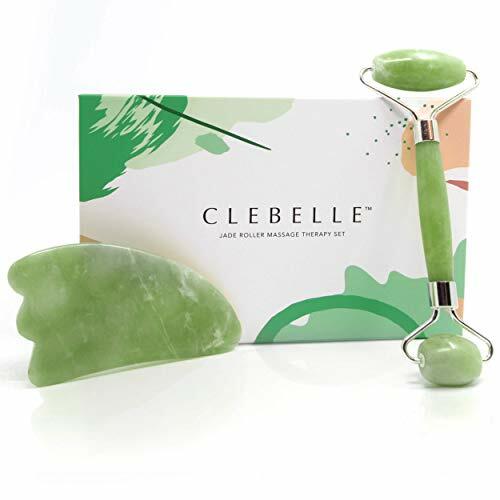 &#x1F486;&#x1F3FB;‍ABSORBENT SKIN - The gentle rolling motion of the Jade facial massager helps improves blood circulation. opening the skin, absorbing skincare products better. Use the roller after applying your favorite moisturizer/ serum, increasing effectiveness and potency, to help achieve your skin goals. &#x1F486;&#x1F3FB;‍REDUCES PUFFINESS - Using the bigger Jade roller can help drain your facial lymph nodes. A clogged lymphatic facial channel is what causes puffiness and that swollen face we sometimes wake up to in the morning. Using a chilled jade roller (in the ref) will help you look fresh and healthy daily. &#x1F486;&#x1F3FB;‍COMBATS AGING - By massaging your face every night using the smaller jade roller, you can help reduce fine lines, wrinkles and dark circles. The gentle massaging action opens up facial blood vessels so that blood flows faster immediately delivering more oxygen & rejuvenating your skin. 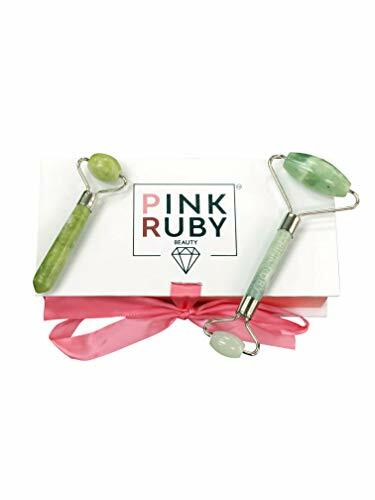 &#x1F486;&#x1F3FB;‍ COME WITH BONUS PORTABLE MINI-ROLLER - Purchase the PinkRuby Beauty's Jade Double Roller Anti Aging Facial Massager and get a bonus single mini roller! This is perfect to keep inside your handbag or make up case so that you can give yourself a refreshing facial massage anywhere you may be. *NATURAL QUARTZ STONE: Our product is made from 100% real certified natural stone. Naturally cool jade stone has been known as an ancient anti-aging tool in China that can make your face skin smoother and looks younger. 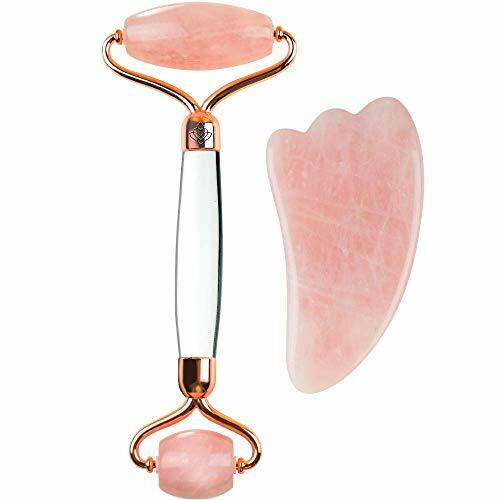 *REDUCE PUFFINESS AND BLOATING: Rose quartz stone helps to reduce inflammation and can immediately remove muscle strain as the roller smooths fine lines and wrinkles. Using jade roller daily will diminish puffiness, dark circles and bloating. Enjoy Healthy & Smooth Massage - Smooth touch feeling that never hurt your skin. Jade facial roller promotes blood circulation, which can reduce puffiness and wrinkling, it is much helpful to relief pressure, always with a relaxative and graceful mood. Use jade massage roller with face cream can help the cream to be absorbed too. Real Natural Jade Roller - The face roller are made of 100% natural jade stone. Anti-aging, anti-wrinkles line, reduce dark under eyes, better skin and health without any chemicals or irritants. A Meaningful & Special Gift - Give the special one a gift of love. 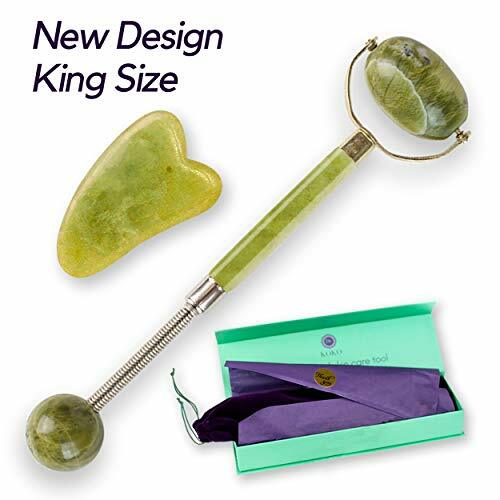 The nephrite jade roller comes in a beautifully designed package, which can be a meaningful gift for elder, mom, grandma, wife, daughter, sister. 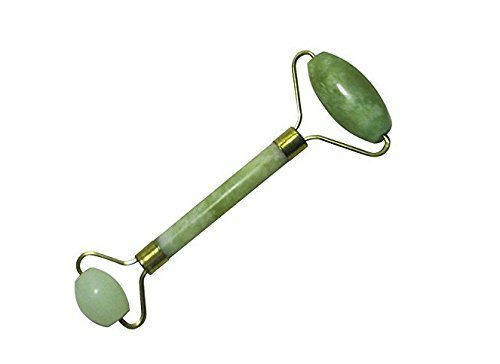 Jade Face Roller - Jade roller massager is ideal for neck, chin, cheeks, forehead, around the eyes, nose, and lips. ❤ BENEFITS: Reduce dark under eyes puffiness, achieves a radiant glowing skin, improves blood circulation, shed dead skin, eliminates clogged pores, better skin and health through natural Jade stones and wood without any chemicals or irritant. 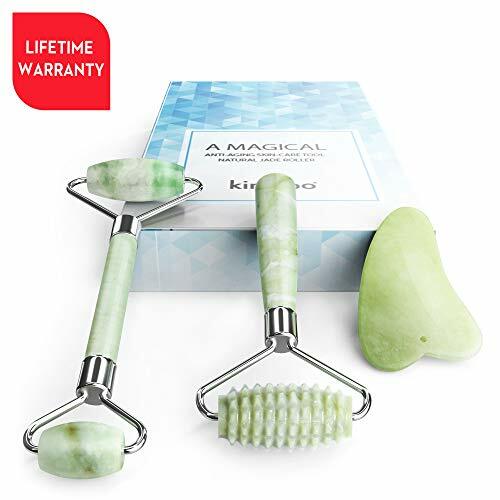 ❤ REAL NATURAL JADE: 100% real jade stone with ultra smooth rolling action for best results, 100% Natural Brush Bristles used to exfoliate skin. 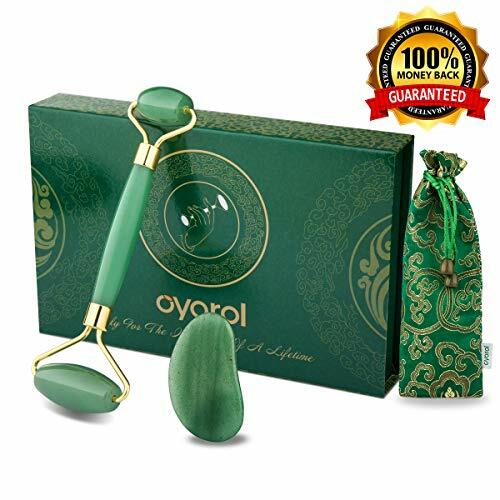 ❤ PERFECT BEAUTY GIFT: Natural Essence Jade Roller set is a skin care tool will cool, tighten, and de-puff your face in seconds as it massages. Using the brush to exfoliate the skin before and after using the roller, leads to smooth and radiant skin. ❤ 100% SATISFACTION GUARANTEE: Exchange, Replacement or Refund guaranteed.This is the best gift for your mother, sister, daughter, girlfriend, wife for their Christmas, xmas, birthday or valentine's day. It serves many purposes such as anti -aging, acne treatment, dark spots therapy, fine line massager, wrinkles removal. The gua sha scraping tool is genuine jade. It is ideal for massaging or as a massager. ✅ GemZen JADE ROLLER & GuaSha includes two types of authentic jade stone ensuring you receive all the natural healing benefits of the stones without any chemicals or irritants. Feel less tense and look tighter by increasing lymphatic drainage and stimulating collagen production! ✅ Benefits - Reduce puffiness, dark circles under eyes, wrinkles, acne, and fine lines using our all natural, chemical free anti-aging skin-care beauty toolkit as a part of your daily routine. Relax your face and body while increasing lymphatic drainage thus improving blood circulation, stimulating collagen production throughout the body giving a blissful feeling of pronounced beauty. ✅ GET THE GLOW - Use the products you love to promote healthy looking skin. Our 100% genuine Jade stone roller & GuaSha set is here to give you that healthy glow. The Jade stones smooth surface gently messages your skin while restoring your complexion and revitalizing your natural glow! ✅ AFFORDABLE QUALITY - Treatments with a professional are expensive. With daily use, our all natural Jade tool set can help you achieve your skin goals for a fraction of the cost! Looking your best has never been this affordable! ✅1000's OF HAPPY CUSTOMERS - Your satisfaction means everything to us. Feel confident knowing you've made a safe choice with our 30-day 100% money back guarantee. We are so confident you'll love our Facial Roller & Gua Sha set that this is our promise to you! AUTHENTIC ROSE QUARTZ CRYSTAL- Rose quartz crystal speaks to the heart chakra, attracting loving energy and encouraging the release of negative emotions. Embrace your inner beauty and glow from within with the spiritual benefits of crystal rose quartz facial roller massage. NATURAL ANTI-AGING BENEFITS OF FACIAL MASSAGE: Facial massage has been used for centuries for skin concerns including wrinkles, under-eye puffiness, and acne. A face roller is the easiest way to show your skin some extra TLC with a relaxing facial massage. REDUCE WRINKLES & FINE LINES: Facial massage increases circulation and blood flow to help plump up skin to for less visible signs of aging. 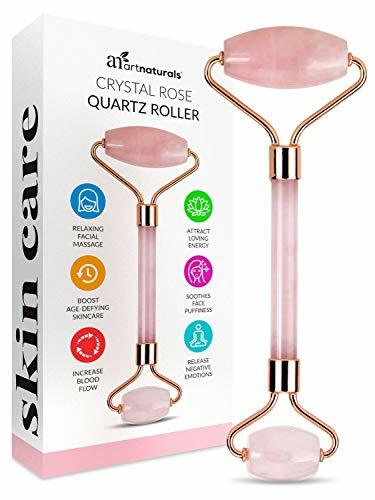 HELPS SKINCARE PRODUCTS WORK BETTER: Rose Quartz Face Roller helps skin absorb moisturizers, lotions, serums, and anti-aging creams better, for better results and younger looking skin. SATISFACTION GUARANTEED: All ingredients used in ArtNaturals products are Sulphate-Free, Gluten-Free, Cruelty-Free, Paraben-Free and GMO-Free. Satisfaction guaranteed or 100 percent refund of purchase price. You have nothing to lose and only your health to gain! &#x1F496; 100% NATURAL JADE STONES - Our Jade Rollers are made from premium quality jade stones that came straight from the Himalaya ranges. &#x1F496; NO MORE WRINKLES - CobraMama Jade Roller is designed to make your skin looks younger and free of wrinkles. Use it as your daily routine and you will feel the different. Use it on for facial, neck, arms legs or anywhere. &#x1F496; PROMOTES BLOOD CIRCULATION - The Jade Roller will promote blood circulation and make you more relax. It's also known as the Chi roller because it can increase chi, a life force energy that's very important to your body. 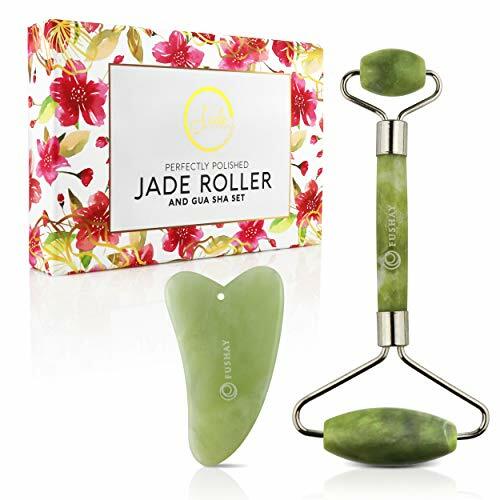 &#x1F496; PERFECT BEAUTY GIFT - Jade Roller is a valuable anti-aging massager tool that has been used for thousands of years in China. Plus a free jade pendant that can help with self-healing. &#x1F496; 100% MONEY BACK GUARANTEE: We offer a 100% money back guarantee if you are not happy with our product. No question asked. ✔️JADE ROLLER & GUA SHA PACKAGE - A PURE GIFT FROM NATURE, The only Original & Premium quality Jade Stone Skincare kit made of 100% real Natural Jade , The package can be used to enhance anti-aging benefits, is safe and effective for all skin colors & types . ✔️PERFECT BEAUTY GIFT - Our Jade Roller for face & Gua sha & facial cleansing brush Bundle Package is a Top Quality self skin care tool which is perfecting for gifting at any occasion or keeping for yourself that will cool, tighten, in seconds as it massages . ✔️100% MONEY BACK GUARANTEE - If for any reasons you are not satisfied with our face massager, we will give you a 100% refund. No Reason Exchange . ✔️RELAX YOUR BODY & FACE - Jade rolling can immediately remove muscle strain as the roller smooths fine lines & eliminates wrinkles,it promotes blood circulation & improves lymphatic drainage, tone & tighten facial muscles, improve skin elasticity, reduce the dark circles & puffiness around eyes, improve sinus condition , A better skin through natural jade stones without any chemicals or irritants After using for a couple of days,you'll notice some significant changes,look tighter & facelift . ✔️EASY & VERY SIMPLE USE - Facial Roller has a double ended roller to accommodate different facial areas: the smaller roller for eye area, while larger one for neck ,face, arms etc. Roll the product in an up and out motion from the neck toward the forehead.& GUA SHA SCRAPER - Keep it at a 15 degree angle when moving from the center of the face towards to the hairline, then down the neck towards collar bone. For extra healing, relaxation and inflammation reduction, place the ice roller . Jade rollers function - improves blood circulation, alleviates tension, relieves pain, enhances skin permeability, relieves skin oiliness, relieves acne, reduces dark circles, improves blood circulation, wrinkles, brightens skin, promotes metabolism, relieves skin tension,Soothing puffy. 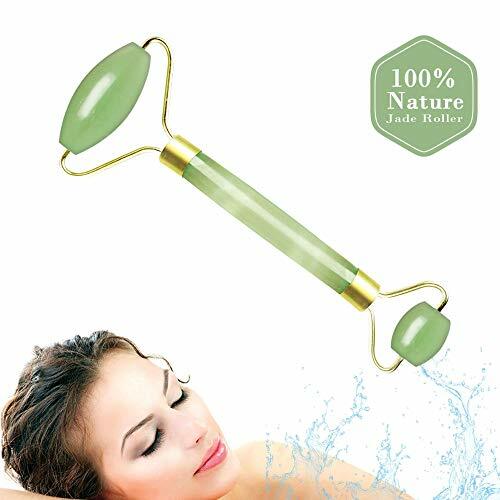 Natural Manual Control- Jade roller for face rotate design adept the whole body skin. Long-term use benefits - it can achieve effect of face slimming, promotes face-lift skin tightening, body shaping. Birthday GIFT - you can send it for your girl friend as a Valentine's Day gift ,Christmas day gift, Thanksgiving gift or Mother's Day gift. HANDMADE, AUTHENTIC & CERTIFIED 100% NATURAL JADE STONE to promote a healthier skin. 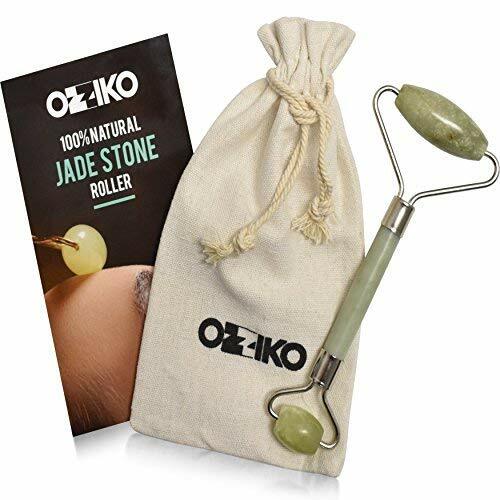 Ozziko natural Jade roller helps remove sub-surface water therefore reducing the appearance of wrinkles and fine lines on the forehead, eyes, along the nose and mouth. The rollers also have smoothening and lightening effects on the skin due to the silicate minerals found in pure jade. DOUBLE END ROLLER - Easy to use and clean. Ozziko's Jade Roller is lightweight and easy to carry with its carrying case that arrived . It's also very easy to clean after use. Simply use a non-alcohol wipe after and before next use. NOTICE: DO NOT wash the jade roller in hot water or expose to harsh chemicals. USE 3-4 TIMES DAILY FOR A YOUNGER, HEALTHIER SKIN - Daily use promotes anti wrinkles natural treatment, Neck Firming, Tighter and Smoother Skin. HELPS IN LYMPHATIC DRAINAGE - Jade stone roller promotes proper blood circulation on the face and neck. It also helps in lymphatic drainage to provide healing and avoid puffiness. It gets rid of excess fluid and toxins by massaging towards drainage points such as along the ears and right by the clavicle. Redesigned Premium Upgrade (Late 2018) - This newly designed Jade Roller has been reengineered based on customer feedback. That means you will not have the issues you read about with other models. The pieces are welded and reinforced so that it will not break. Check out the video. oSilent - Anti-Squeak roller inserts are mounted inside of the stone for noiseless operation. Feel the benefits better facial tone and smoother skin. Jade mined from Hymalayas. Face, Eye, and Neck beauty roller firms skin, removes wrinkles, and slim face. The set is designed to stimulate collagen production and blood flow to reduce fine line wrinkles and shrink enlarged pores. Desired effects come from rolling sessions under 10 minutes. The rolling motion promotes detoxification and drains impurities through lymphatic system. 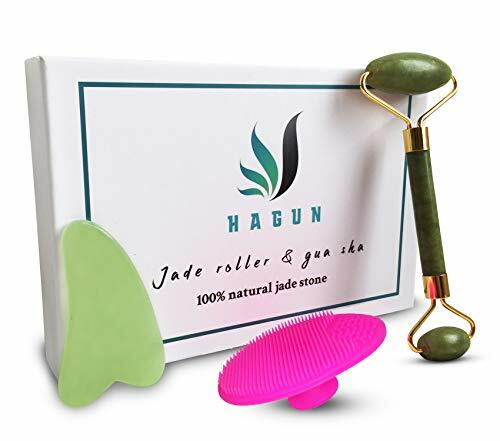 ✅ SKIN REJUVENATION | Jade Roller is an extremely effective massage roller that eliminates wrinkles and fine lines around your forehead, eyes and neck, caused by fatigue and stress during each day. Allow this face roller to rejuvenate your face and offer you the skin care you deserve. ✅ PUFFINESS REMOVAL | Cool to the touch and soothing on your skin, this face roller removes the look of puffy face and puffy eyes before and after your long working days. 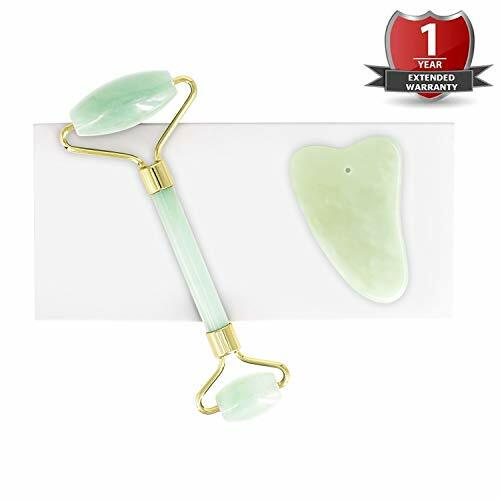 Practical and easy to use, you can use this jade roller for face anytime and anywhere. ✅ BOOST YOUR BEAUTY | With our 100% real natural jade roller, your skin will recover under the smooth and cold sensation of jade stones and you will feel and look much younger! Allow your face to better absorb your facial serums and beauty cream nutrients. Get your jade roller for face now! ✅ ENERGIZE & DETOX EVERYDAY | Rolling this jade roller will stimulate your blood circulation and lymphatic system to flush out the toxins. This facial roller increase the production of collagen to reveal your youth, reduces inflammation and promotes healing. ✅ GUARANTEE & REPLACEMENT | Our Customer Support Team will always assist you and will change your jade roller immediately if you are not satisfied! This massage roller is made from 100% authentic natural jade and its metallic frame is securely welded together for extra sturdiness. Forget those jade rollers and facial tools made with poor quality materials. We use only natural jade so you can be sure that will last forever! Excellent gift for women! 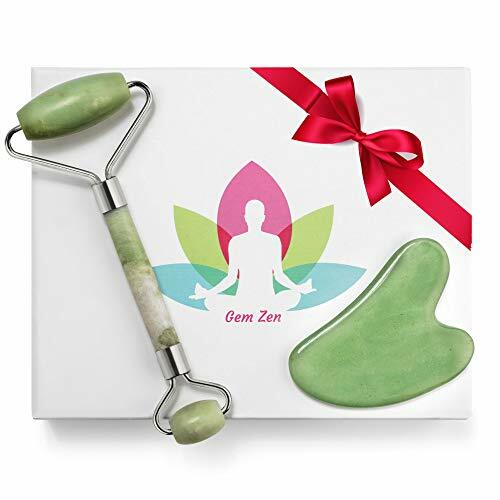 ✅100% GENUINE JADE: Our jade face massager is made of 100% natural jade stone, mined from the mountains of Himalayan, and has an ultra-smooth surface texture. This means it won't scratch your skin and will be able to roll smoothly. Authentic jade brings good result to your skin, fake jade brings no result! Make a wise choice! ✅NO MORE PUFFINESS AND BLOATING: Using our jade facial roller as a part of your daily routine will diminish puffiness, dark circles, and bloating. Also, it promotes blood circulation and improves lymphatic drainage. After using for a couple of days, your face will be less puffy, feel less tense, look less saggy and facelift. ✅ELIMINATES WRINKLES AND FINE LINES: Relax yourself by massaging your skin with our jade ice roller. Jade rolling can immediately remove muscle strain as the roller smooths fine lines and eliminates wrinkles. A better, healthier skin through natural jade stones without any chemicals or irritants. ✅OUR PROMISE: Our jade facial massager comes with a FREE Instruction Card and a one-year replacement warranty. If for any reasons you are not happy with your roller, we will give you a 100% refund. No questions asked! BUY NOW and stay beautiful. 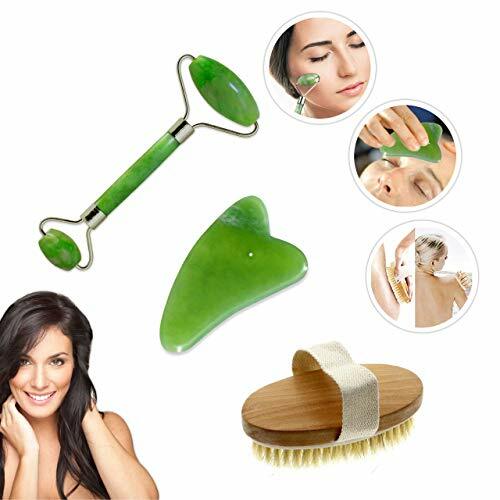 Rejuvenate Your Skin: Use Jade Roller and Gua Sha Scraper massaging your body parts (face, eye, neck, back, arms and legs etc) to relieve fatigue and stress from your work, study, drive or excise. Reduces the dark circles, puffiness and promote blood circulation around the eye area with the roller, and increases lymphatic drainage resulting in less inflammation and puffiness. Free Your Beauty: Jade Roller reduces your dark circles under the eyes and puffiness; promote blood circulation to the eye area. After a few days, you will notice some significant changes. It will reduce puffiness in your face and eyes. Your face will be less puffy, feel less tense, look tighter, and face lift. 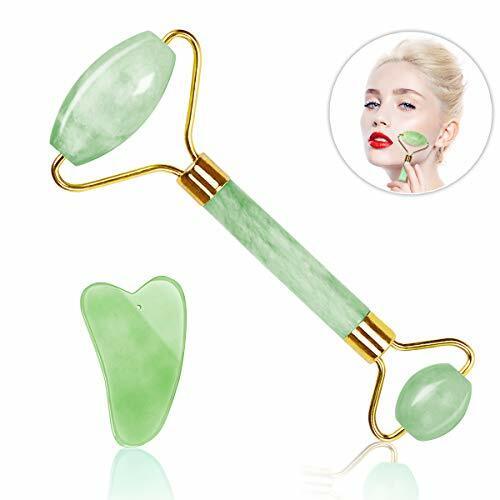 How to Use: The Jade Roller: Yeamon Facial Roller has a double ended roller to accommodate different facial areas: the smaller roller for eye area, while larger one for neck ,face, arms etc. Roll the product in an up and out motion from the neck toward the forehead. The Gua Sha Scraper: Keep it at a 15 degree angle when moving from the center of the face towards to the hairline, then down the neck towards collar bone. Get The Most Bang: Jade Roller can boost the effectiveness of your skincare products. Using the roller after you've applied your favorite serum or cream allows ingredients to penetrate more deeply into your skin and get to work faster. Handmade. Please note that due to the nature of the real jade stone each piece varies in color and size from the picture listed. but all have healing properties. &#x1F384; THE ULTIMATE BEAUTY & FACIAL PACK: If you are a two bird one stone kind of gal, then this 2 in 1 beauty pack is the way to go. 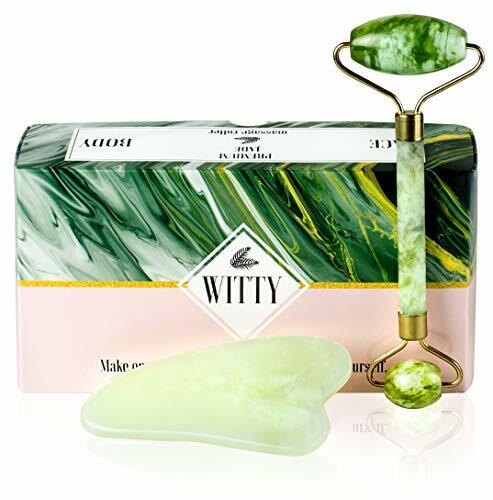 The Dr. KOKO set includes a genuine green jade stone roller, gua sha scraping massage tool, an elegant gift box, a velvet carrying pouch, an informative brochure and an eBook with beauty tips! Everything you need is included. &#x1F384;DOUBLE SIDED - DOUBLE COMFORT: This NEW design natural jade face roller is meticulously designed to be larger than others yet more comfy to hold. Facilitate rolling, holding, face massaging and skin nourishment to the fullest. The double sides ensure extra facial benefits for your pretty skin. Use all over your face, neck, décolletage, belly, thighs or anywhere else you fancy. &#x1F384; YOUTHFUL LOOKING SKIN IN LESS THAN 5 MINS: Do not let anxiety, late work nights, eye puffiness and the first fine lines make you look tired and dull. Revitalize, boost lymphatic drainage, tighten, sculpt and nurture your skin like never before. With only a few minutes of your time. You can freeze face roller & gua sha natural stone face roller for enhanced cooling results on your skin or use on the go. &#x1F384;SO VERSATILE - SO MANY SKIN BENEFITS: From relaxing tense facial muscles and erasing expression wrinkles, smoothing dark circles, to depuffing your eyes & face, supporting collagen production and helping your favorite serums to quickly penetrate your skin, this authentic jade roller is the way to go. Enjoy a flawless, healthy and radiant skin again. -Double-head design with a big roller and a small roller. The big roller always massages your face, head and small roller suit massage nose, eye and so on. 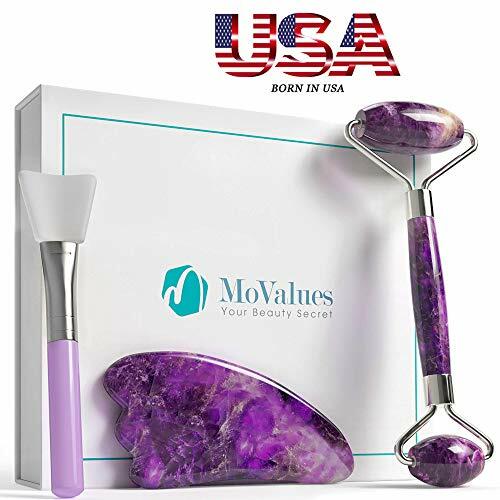 - Using Gua Sha Scraper with essential oil/cream to massage shoulder, neck, muscle, arm, and body, then promote blood circulation and eliminates toxins. Keep it at a 15-degree angle when moving from the center of the face towards to the hairline, then down the neck towards collarbone. 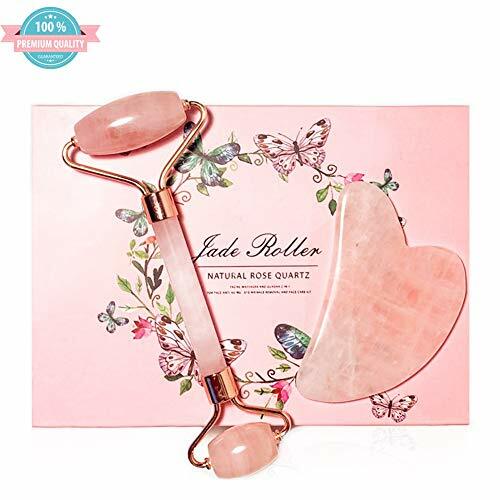 ❤️ 【100% ROSE QUARTZ HEALING STONE】Unlike all other rose quartz rollers, ours is the latest generation of real natural roller built to last for years. It has gold color plated wide frame made as a single CNC molded unit (zero connections) so the rollers will never break or squeaky noise while rolling. Handle is made with genuine rose quartz stone and thick curved shape makes the handle 3x times stronger than usual. Do not fool for cheap welded or glued rollers. ❤️ 【BEST QUALITY EVER MADE】Unlike all other facial rollers, ours is the latest generation of real natural jade roller built to last for years. It has gold color plated wide frame made as a single CNC molded unit (zero connections) so the rollers will never break or squeaky noise while rolling. Handle is made with genuine rose quartz stone and thick curved shape makes the handle 3x times stronger than usual. Do not fool for cheap welded or glued rollers. ❤️ 【GUA-SHA FACIAL TOOL】We included Professionally crafted gua sha scraping massage tool to improve skin tone, texture, and remove wrinkles. Ours is the best depuffer tool for instantly releasing muscle strain and remove toxins. Gua sha scraping will instantly result firm, vibrant, tighter, and naturally glowing skin. 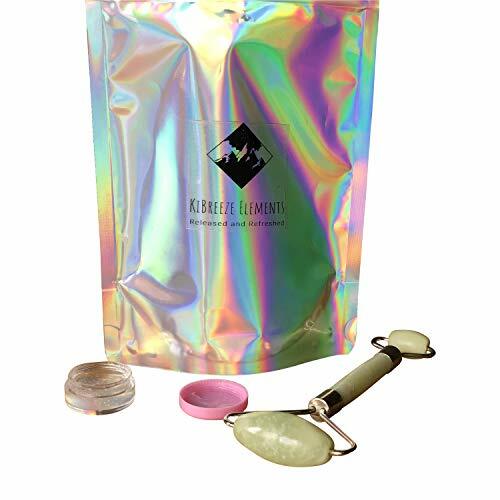 Our Shock proof dual protective foam package guarantees the best protection for jade gua sha tools during shipping. 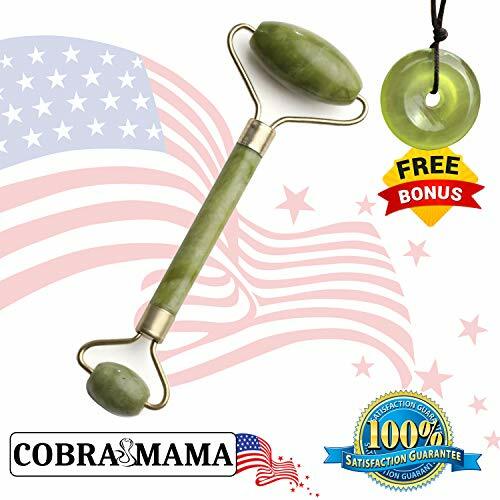 ❤️ 【100 % MONEY BACK GUARANTEE】If you are not satisfied with our facial massager Roller Gua Sha set for whatever reason, we will give you a 100% refund or a free replacement, with no questions asked! BUY NOW and stay beautiful. Place your order now with confidence and Keep glowing with your youthful and healthy skin. Ordena tu rodillo de rose facial ahora! ✅100% Real Jade - made of natural jade and stainless steel joints, free of any chemicals or irritants. Eliminate muscle tension, jade roller can smooth fine lines, make skin glow healthy and radiant.Reduce dark circles edema and improve skin health. The flexible and compact size is suitable in any body parts: face, neck, arms, back, or legs. Keep it in your refrigerator before you use to receive a better experience. ✅Lifetime Warranty-We have a lifetime warranty on the products in this kit. If there is any need, please contact me at any time. ✅LIMITED EDITION AMETHYST ROLLER: Our jade facial roller is made of 100% natural amethyst; It's very classy and beautiful! ONLY limited quantity available in the market!Amethyst has many benefits including calming inflammation and acneic skin. This crystal soothes away day-to-day stresses because it attracts positive energy while ridding your body of any negative emotions- feelings of stress, anxiety, fear, depression and more. ✅NO MORE PUFFINESS AND BLOATING: Using our face massage roller as a part of your daily routine will diminish puffiness, dark circles, and bloating. Also, it promotes blood circulation and improves lymphatic drainage. After using for a couple of days, your face will be less puffy, feel less tense, look less saggy and lift your face. ✅ELIMINATES WRINKLES AND FINE LINES: Relax yourself by massaging your skin with our facial roller. Jade rolling can immediately remove muscle strain as the roller smooths fine lines and eliminates wrinkles. A better, healthier skin through natural amethyst without any chemicals or irritants. ✅OUR PROMISE: Our face massager comes with a FREE mask brush and a one-year replacement warranty. If for any reasons you are not happy with your roller, we will give you a 100% refund. No questions asked! BUY NOW and stay beautiful. 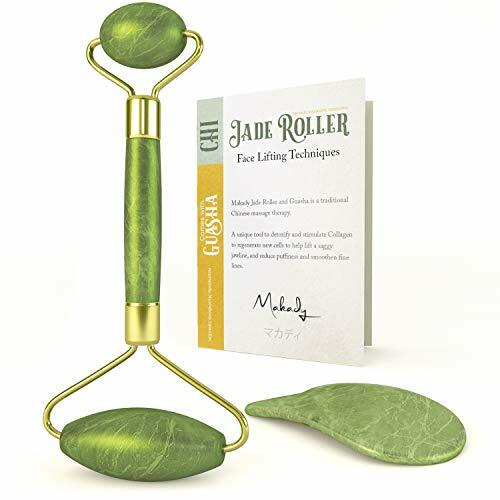 ✅NEW IMPROVED DESIGN: Unlike other jade face rollers which are made of brass and glued together, breaks easily, squeaks when rolling, or simply just break after a few uses, the MoValues jade rollers are made with a new improved design which makes it stronger and less likely to fall off. It comes with a stronger integrated frame, reinforced handle, and no squeaky sound when rolling. It will last longer than other brands available on the market. We promise our jade roller is the BEST ON MARKET! ROSE QUARTZ ROLLER - Our 2 sided rose quartz roller has all the benefits of a jade roller with the added beauty of rose quartz, a symbol of love. GUA SHA - We've included an additional tool to also help improve skin tone and texture. It's as effective as the roller. AMAZING BENEFITS - Helps improve blood circulation, skin tone, an elasticity of the skin, and lymphatic drainage. Also reduces puffiness, wrinkles, dark under eye circles, and eliminates toxins. DURABLE - Our premium rose quartz roller and gua sha is handmade and built to last. Some of the major features include a single-piece unbreakable metal with reinforced glass handle. PROTECTED PACKAGING - Precious stones need to be handled with care. Our rose quartz roller and gua sha are in a beautiful box with top and bottom padding to prevent damages during shipping. 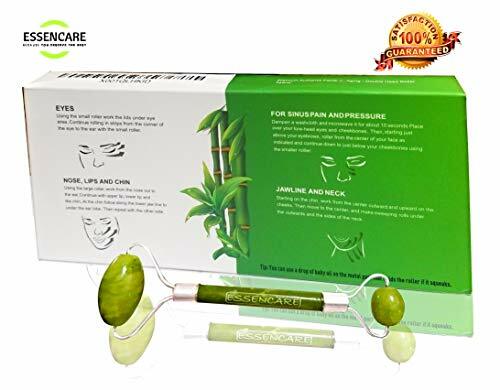 ✅ IMPROVES AND REJUVENATES YOUR SKIN: Forget about costly cosmetic surgeries and beauty products that do less than good to your skin and embrace our all natural jade roller that has earned its place as one of the finest beauty and personal care products on the market today. With our jade roller to the rescue, you can finally improve your skin tone, get rid of wrinkles and fine lines, fight the effects of aging and spot a healthy skin glow that will make you the envy of others. ✅ IMPROVES BLOOD CIRCULATION: While our jade roller is essentially designed to bring out the best in your skin, they also help improve blood circulation which in turn results to a healthy and glowing skin. More than this, it also improves skin elasticity and lymphatic drainage while reducing puffiness, wrinkles and dark circles under the eyes. ✅SUPERIOR QUALITY: Our jade roller beauty set has been designed using premium quality materials including jade mined from the Xiuhan Mountains. This ensures that our jade roller lasts long without falling apart. Interestingly, our jade roller has no loose jade pieces or fragile parts, so you can use it with confidence every time. ✅ ERGONOMICALLY DESIGNED: Our jade roller and Gua Sha massage tool set has been designed to work for all skin types and ages. 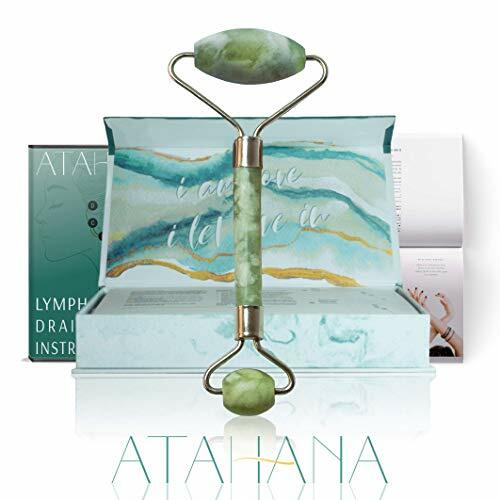 Featuring two smooth jade rollers on each end, this beauty products allows you to easily massage the entire body including hard to reach areas. ✅100% SATISFACTION GUARANTEED: Its either you're satisfied, or you get a full refund with no questions asked. This is because we are a brand who place huge premium on customer satisfaction. 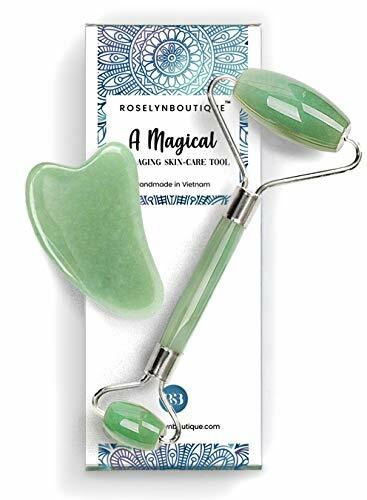 BEAUTY ESSENTIAL RoselynBoutique's Jade Roller is a skin massager tool will cool, tighten, and de-puff your face in seconds. Reduce Pufiness, Wrinkles & Fine Lines - Using our anti-aging skin face roller will help to relax your face and body and will reduce the dark circles, puffiness and promote blood circulation around the eye area with the roller & gua sha, and increases lymphatic drainage. reduce puffiness in your face/eyes. Customer Guarantee - We promise the jade roller will more than your expectations with high quality, We can give you a refund if you are not satisfied with it. , then CONTACT US and we will give you a exchange or refund new item until you are satisfeid with it. 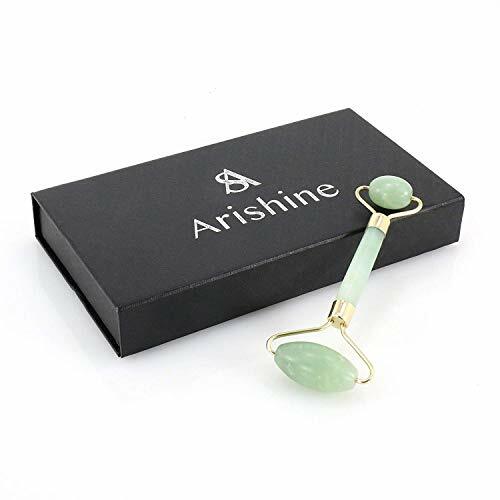 Jade Roller & Gua Sha Set- Original & Premium quality Jade Stone Skincare kit made of 100% Natural Jade mined fstainless steel holders for stronger holding & smoothly rolling. The jade roller for face can be used to enhance anti-aging benefits rollers effective for all skin colors & types. Easy to use,it will gives yousmooth touch and does not squeak, the smaller roller for eye area, while larger one for neck & face. Birthday GIFT - you can send it for your girl friend as a Valentine's Day gift ,Christmas day gift, Thanksgiving gift or Mother's Day gift. 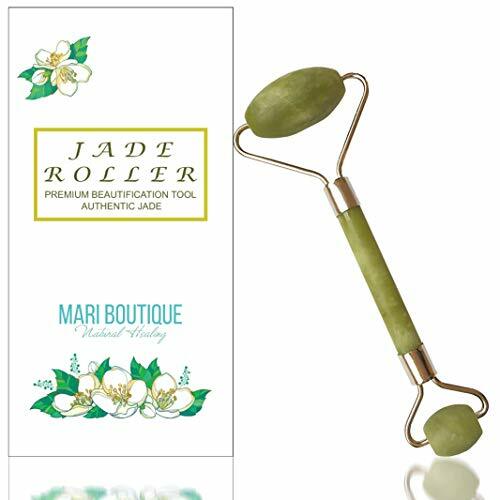 Our Jade Roller is a Top Quality Boutique face eye massager which is perfecting for gifting at any occasion or keeping for yourself that will cool, tighten, and de-puff your face in seconds as it massages. Jade rollers function - improves blood circulation, alleviates tension, relieves pain, enhances skin permeability, relieves skin tension,Soothing puffy,relieves skin oiliness, relieves acne, reduces dark circles, improves blood circulation, wrinkles, brightens skin, promotes metabolism. SELF-LOVE - Use your Jade Roller as a self love tool by incorporating it into your morning or night routines. According to Chinese legend, jade stone can balance your Chi and promote spirituality. And it represents the heart chakra! REVITALIZE YOUR SKIN - Add facial rolling to your daily routine and see real anti aging benefits! It will tighten and tone your skin, promote blood circulation, and skin elasticity. The cooling stone feels amazing and fights dark circles, puffy eyes, and under eye bags. Learn do a lymphatic drainage massage with our free BONUS VIDEO. 100% NATURAL STONE - Our roller is hand-cut from authentic Xiuyan Jade mined from China. This jade has extensive history and the people hold it in high regard. Add facial rolling to your daily routine and see real anti aging benefits! It will tighten and tone your skin, promote blood circulation, and skin elasticity. The cooling stone feels amazing and fights dark circles, puffy eyes, and under eye bags. Learn do a lymphatic drainage massage with our free BONUS VIDEO. OUR PROMISE TO YOU - The market is full of rollers that fall apart, or have fake stone. That's where we're different - we ensure our rollers have natural, green jade and a smooth roll. No one else can make this promise. * ATAHANA GUARANTEE - We know what makes a great roller - and we promise that's what you'll get. We stand behind our roller so confidently, that we offer a full refund for 60 days. If you are not completely satisfied with your order for any reason - reach out to us. We will take care of you! ★The coolness of the jade closes pores while the roller promotes blood circulation, which can reduce puffiness and wrinkling.Great for puffiness in the face or under eyes. Help absorb the nutrients and ingredients when applying mask or before bed with your face serum. ★Double-head design with a big roller and a small roller. The big roller always massage your face ,head and small roller suit massage nose, eye and so on.Applying barely any pressure, make you relaxing after work. ★Smooth touch feeling that never hurt your skin. Use with face cream can promote the cream absorptioned. Often using Jade Massager could be perennial youth. Use as muscle and smaller forehead roller, rolling antiaging neck and dual double massager. Pampering the area beneath your face is just as important as the face itself. 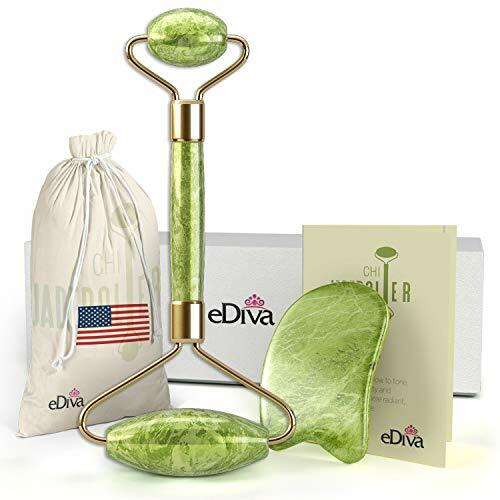 ★To give your skin a healthy glow, Suitable for wrinkles, weight loss, skin tightening, using the Jade Massager 3 days a week for 5-10 minutes at a time is recommended. When finished, using the large roller, make sweeping rolls from under the chin to the collar bone working out to the side of the neck and starting each sweep from the chin. ★This Comb can be used on the head and is a healthy product. The scalp may be slightly reddish when used but quickly dissipates. Promote the head of the blood circulation, you can rest assured purchase. BENEFITS | Reduce Dark Circles and Puffiness Under Eyes, Improve skin and health through natural jade stones massage without any chemicals or irritants. FEATURES | We improved the Jade Kit with a patented silicone/plastic insert that will NEVER squeak, and made the metal holders from Zinc Alloy that will NEVER rust. REAL NATURAL CERTIFIED STONES | 100% authentic jade stones that are mined from Himalayan & Liaoning province. In each kit, you will find a quality certificate which you can check the genuine of stones anytime. FACIAL USAGE | Using this anti-aging ancient Chinese beauty tool as a part of your daily routine will relax your eye area, forehead, neck, cheeks, chin, and lips. Will help tighten, slimming and healing your skin, also will help reducing puffiness, and fine lines. BODY USAGE | Using the Jade Products on your skin will improve your blood circulation, posture, relax your muscles and rejuvenate your skin. √ BENEFITS: Anti-Aging, Anti-Wrinkles line, Reduce dark under eyes, Better skin and health through natural Jade stones without any chemicals or irritants. √ SAFE FOR ALL : Our Jade Roller used 100% Natural Jade stones without any chemical solution. We promise you will have effective results with our Jade Roller - if for any reason the product fails to meet your expectations, we offer a 100% money back guarantee (Exception applies to physical damage by the customer). √ DUAL SIDED ROLLER: The larger roller is ideal for areas like the neck, chin, cheeks, and forehead, while the smaller roller is perfect for areas around the eyes, nose, and lips. √ AFTER SALES SERVICE: Quality problems occur within one year replacement, lifetime warranty, if you're not completely satisfied, then CONTACT US and we will give you a 100% refund within 30 days of purchase. 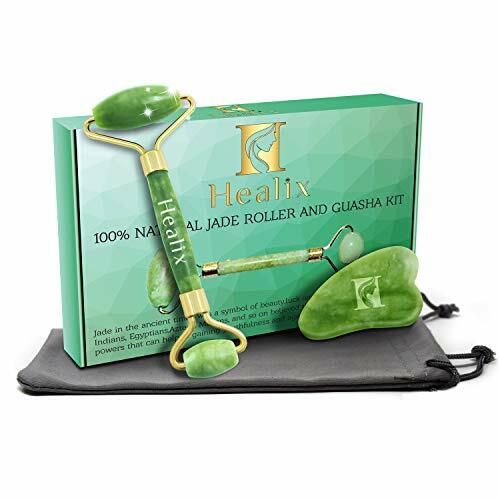 JADE ROLLER BENEFITS : Reduce dark circles and puffiness under eyes, Improve skin and health through natural anti aging Jade stones without any chemicals or irritants. 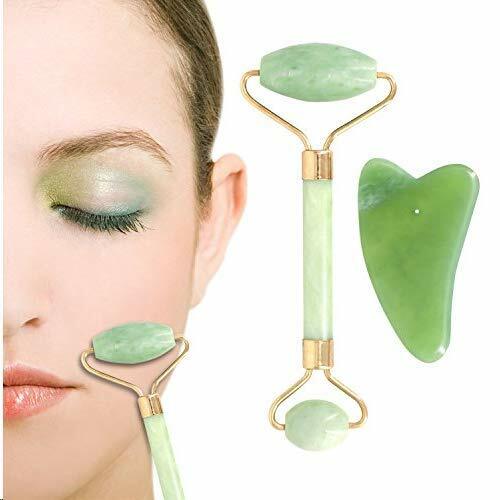 EASY TO USE : Jade Face Roller Tool has a double ended roller to accommodate different facial areas: the smaller roller for eye area, while larger one for neck ,face, arms etc.You can do a lymphatic massage for lymph drainage. Roll the product in an up and out motion from the neck toward the forehead. RELAX YOURSELF : Jade Rolling restores your complexion and revitalizing your natural shine while transforming it into a clean canvas that is free of acne. Immediately remove muscle tension as the roller smooths fine lines and eliminates wrinkles and gives your skin a healthy glow. ORIGINAL: This is the only original best jade roller in the market, so make the right choice now. ✅ FEEL CONFIDENT IN YOUR OWN SKIN: Say goodbye to the fine lines, sleepy puffy face and the dark circles under your eyes in the morning. Your skin will feel fresh, rejuvenated and more alive. Gentle massage eliminates toxins and promotes lymphatic drainage and blood circulation which lifts and firms skin and it's a major contributor to that clean-living, eight-hours-of-sleep glow we all strive for. After a few weeks, you should notice a significant difference. ✅ TREAT YOURSELF WITH AN EASY SPA-LIKE TREATMENT: Give your overworked facial muscles a little love. You can benefit from the cooling stone as it eases headaches and the pain of sinus. It helps to ward off stress, anxiety and other general Mondayness. After a long and hard day at work, we suggest you include jade face roller into your night routine. The kind of relaxing pre-bed ritual that sleep experts say you should get into before you turn in for the night. ✅ CONVENIENT & MULTIFUNCTIONAL HOLY GRAIL: You can use your face massage roller anytime, anywhere! Use it while watching your favorite TV program or while reading a book. Use the smaller roller for areas around eyes, nose and lips. Use the big one for forehead, cheeks and chin and slowly continue to roll on neck, collar bones, shoulders, wrists and forearms. Don't forget that pampering the area under your chin is just as important as the face itself! ✅ ANCIENT CHINESE TREATMENT: Gua Sha stone is called the Eastern Botox or Facelift for a reason. This spa acupuncture therapy promotes to reduce wrinkles and fine lines, lifts eye lids, release muscle tension, tighten the skin, reduces sagging and puffiness and diminishes blemishes and dark spots. WITTY Gua Sha Board makes you feel less stressed and more energetic. 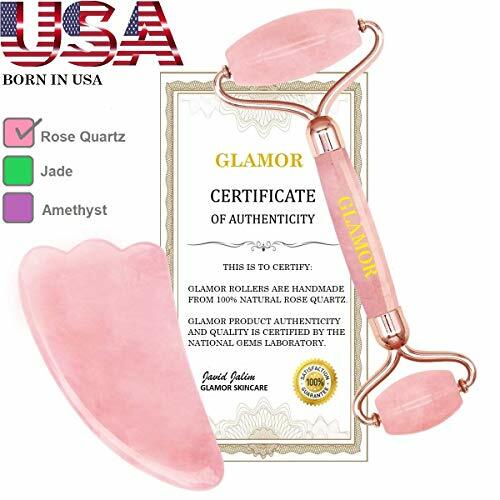 PREMIUM NATURAL ROSE QUARTZ - This Jade Roller is made of 100% natural Rose Quartz, a stone that feels cool to the touch and helps revitalize your skin to a youthful and beautiful glowing tone. GET ONE MONTH OF FACIAL SERUM - Use the code in your e-mail to get one month of free facial serum on our website www.adorlita.com! HELP INCREASE BLOOD FLOW & HELP SKIN RENEWAL - Be consistent and use it as a part of your daily routine. Relax your face and body. Improve your blood circulation and reduce stress. TWO ROLLER SIZES FOR ALL PURPOSES - Features two roller sizes. Use the primary roller for general purpose. Use the secondary roller to reach winkles. Works better when cooled. &#x1F338;ROSE QUARTZ ROLLER - Our rollers are made from natural rose quartz stone which improves skin health without any chemicals or irritants. They are hand crafted which provides smooth touch feeling that will never hurt your skin. Using it as part of your daily routine will help reduce wrinkles and puffiness, improves blood circulation and relief stagnant energy called chi. Releasing this energy and pressure will always put you in a graceful and relaxing mood. &#x1F338;GUA SHA - With our Gua Sha Stone Cooling effect and Proprieties, you will enjoy a spa treatment from the comfort of your own home. They are crafted and polished, so it glides over your skin softly and smoothly without any irritations. Both scraping and rolling tools cooling effect will help with the muscle relaxation, improve posture, release tension and muscular soars. 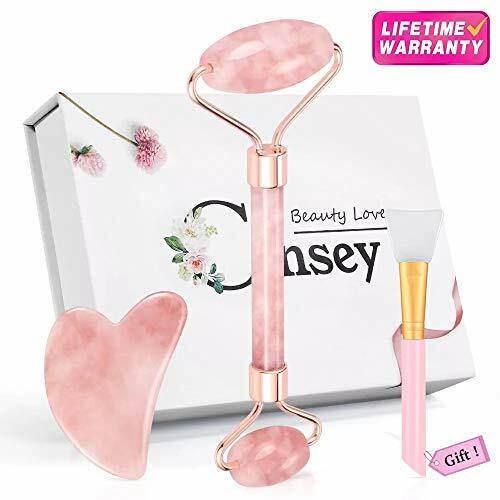 &#x1F338;FACE MASK BRUSH - We have included a free complementary product for you to applying lotion/cream to the facial area for improving skin tone,texture and increase product absorption while using the rose quartz roller. &#x1F338;GIFT BOX & SAFE PACKAGING -We understand precious stones need to be handled with care so our 3 in 1 Rose Quartz Roller set are in a beautiful box with padded foam to prevent damage during shipping and makes it the perfect gift for your love ones. &#x1F338;100% MONEY BACK GUARANTEE - Buy with confidence, our 3 in 1 Rose Quartz Roller set comes with 100% Customer satisfaction. If you are unhappy with our product, please do not hesitate to contact us for a full refund. No question asked!!! NATURAL QUARTZ ROLLER: The Mostelle SET of roller, gua sha and face brush is 100% authentic made out of real himalayan rose quartz stone. It was not chemically treated so you can enjoy its natural health benefits. Handcrafted to be durable, the set won't squeak or fall apart after just a few uses. FULL BODY DETOX: use our scraping massager tool gua sha with essential oils or creams to relieve tension in your shoulders, neck, back and relieve muscle pain. Improve your blood circulation, eliminate toxins, soothe stress, lessen pains and relax tight muscles through a restoring massage. LOOK YOUNGER: use the jade roller to fight the effects of aging, revitalize your skin, reduce pigmentation, improve acne and gently detoxify your body. Improve your complexion, shrink pores and tighten the skin to reduce fine lines, wrinkles, puffiness, alleviate swelling and dark undereye circles. SAVE MONEY: on beauty products . Our facial roller stimulates blood flow and relaxes and brightens your complexion so it can open up to better and faster absorb your favorite moisturizer, night cream or serum. Ideal for your neck, chin, cheeks, forehead, around and under the eyes, nose and lips. SHARE THE LOVE - the perfect gift set for a special one: face roller & scraping gua sha & facial brush for your family, friends, mom, wife, daughter or sister. The best health and self-care present for any occasion: birthday, anniversary,wedding & mother's day. Giftable box & ebook included! 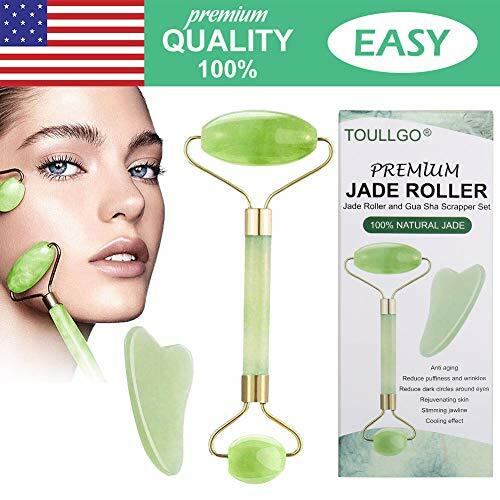 ✅ JADE ROLLER'S BENEFITS: Reduce dark circles and puffiness under eyes, Improve skin and health through natural anti-aging Jade stones without any chemicals or irritants. Smooth touch feeling that never hurt your skin. Jade facial roller promotes blood circulation, which can reduce puffiness and wrinkling, it is much helpful to relief pressure, always with a relaxing and graceful mood. Use jade massage roller with face cream can help the cream to be absorbed too. 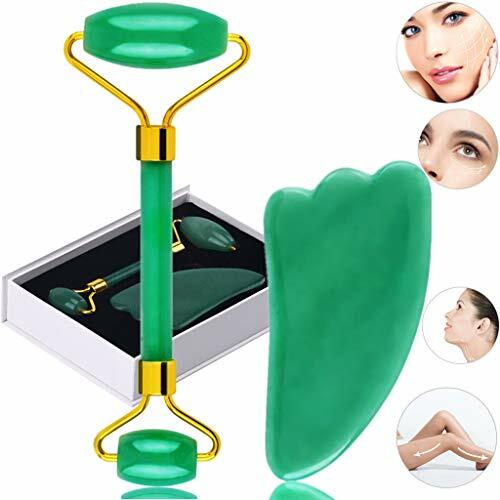 ✅ WHERE TO USE: Jade Face Roller Tool has a double ended roller to accommodate different facial areas: the smaller roller for the eye area, while a larger one for the neck, face, arms, etc. You can do a lymphatic massage for lymph drainage. Roll the product in an up and out motion from the neck toward the forehead. ✅ WHAT YOU GET: There are 1* facial massage roller, 1* jade Guasha scraping tool AND a bonus mask brush in the package. Jade roller massager is ideal for the neck, chin, cheeks, forehead, around the eyes, nose, and lips. Jade gua sha is great for using on your body, massage neck, frozen shoulder, and face slimming. ❤VERY EASY TO USE❤: Very easy to use jade roller for face and better effective keep it cold in refrigerator before you use jade roller massager for face,100% natural real jade roller blooming soft luster,lubricated and smooth texture,the jade color is full,elegant and moist.jade facial roller real jade roller massager puffiness treatments. ❤ELIMINATE PUFFINESS & RELIEVE STRESS❤: Use jade roller in the morning can effectively eliminate facial edema and maintain a good state of the day, ues jade roller at night can promote blood circulation and relieve the stress of one day's work.conveniently scraped jade roller for face, elegantly curved jade roller massager, does not hurt your skin.puffiness treatments face roller real jade massager. 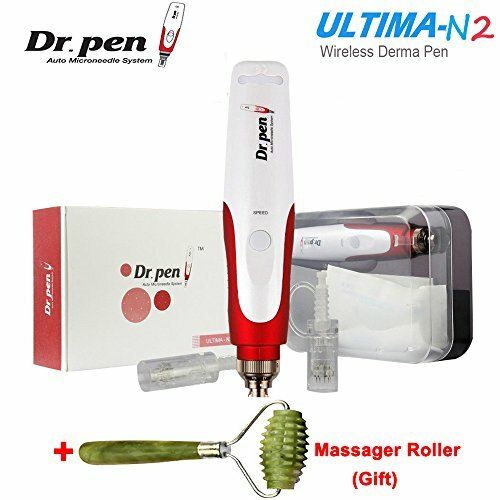 ❤REDUCE FACIAL WRINKLES & DARK CIRCLES❤: Repair facial skin, keeps it fresh & firm and rejuvenates,long-term use of jade roller massager, your skin will be nourished by jade roller, and jade roller massager is also more transparent due to penetration of oil.jade roller for face puffiness treatments facial massager roller. ❤NON-SQUEAKY NOISE❤: Superior quality real jade roller massager for face,durability and no squeaking noise, professional packaging to ensure that jade roller can reach your hands intact.hand polished and smooth jade roller massager, the lines are as smooth and flowing as water.roller real jade face massager puffiness treatments. ✔ROSE QURTZ ROLLER GUA SHA GIFT SET- This is the ultimate Gua Sha Face Roller set that has everything you need to boost the flow of collagen and blood giving you firmer and healthier looking skin. Our rose quartz roller features a robust and ergonomic silver colored handle featuring our logo and an exclusive rose gold tip! ✔INCLUDES ESSENTIAL MASSAGE OIL- Unlike other kits available we have packaged together Gua Sha tools with a soothing and aromatic essential massage oil which enables the rose quartz tools to glide effortlessly across your skin to promote relaxation that you can enjoy in the comfort of your own home. Your skin will have never smelt and looked so good! ✔THE BENEFITS OF ROSE QUARTZ- Stimulate lymph drainage across your body by using our double ended roller and Gua Sha tool. The large roller is for use across the body and the small roller is for use on the face. It has been used for centuries to release toxins and blockages! ✔THE BENEFITS OF GUA SHA - Use our Rose Gua Sha tool to massage the skin and increase circulation. Deal with stagnant energy (Chi) from around the body which many experts believe is the cause of various inflammatory conditions and skin inflammation. To ensure you achieve the best possible results we select each rose quartz stone individually so only the best part of the rose quartz stone is used on each of our rollers! ✔A PREMIUM QUALITY GIFT- The rose gold oozes opulence and looks beautiful when combined with rose quartz. This high end skincare and wellbeing kit is the perfect treat to those who love taking care of themselves with tools and processes that have been followed for centuries! THE SOLUTION: For all the women on the search for a premium skin treatment that will help their complexion fight dark spots, fine lines, and acne, we have exactly what they need: the premium Himalayan jade roller. EASY TO USE: Forget about the expensive trips to the salon and offer yourself a real home-made facial with the double-sided jade roller. All that you must do is apply your favorite moisturizer or serum and massage your face gently.Removable head for easy cleaning. UNIVERSAL REMEDY: The double massage roller will make you forget all about dark circles and puffiness around the eye area. Fine lines and acne are no longer a problem either because the massager will help your skin cells regenerate faster, with healing stone properties. 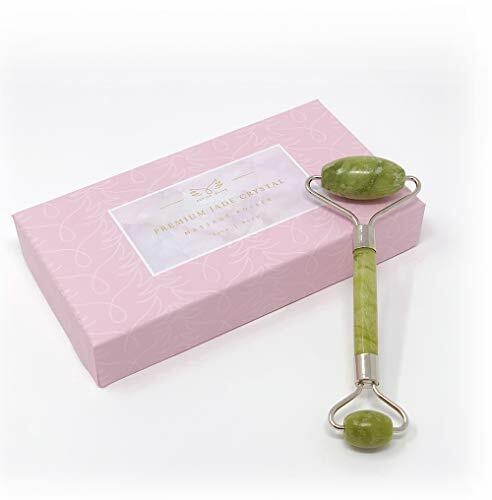 WONDERFUL GIFT: Our special jade roller for glowing skin is a wonderful gift for any woman. The massager comes in a beautiful nylon bag, being perfect for an anniversary, birthday present or to put under the Christmas tree. &#x1F337;REVITALIZE YOURSELF with the our refreshing natural stone roller. The benefits of a genuine Rose Quartz Roller is to reduce puffiness in your face, reduce fine lines and banish dark under-eye circles with a gentle facial massage routine each morning and/or night! &#x1F337;IMPROVE ELASTICITY OF YOUR SKIN every time you use your facial massager roller. Helps detox your skin and encourage healthy blood circulation. Once you have your daily routine in place, you will start to see results! &#x1F490;MAKES A GREAT GIFT (And yes, that includes yourself!) Beautifully effective and super easy to use, our Rose Quartz Roller comes with a 100% customer satisfaction guarantee! Click "Add to Cart" Now! 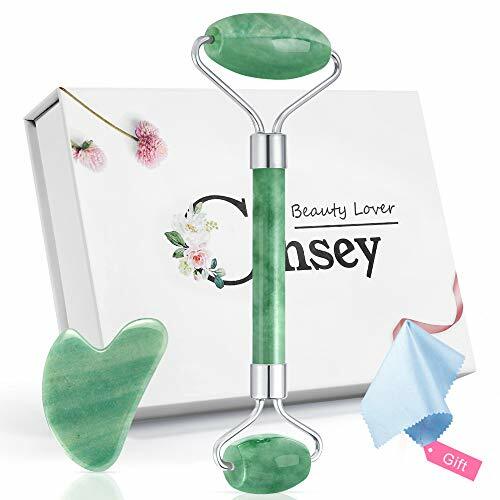 ❦Jade Roller with Duel head roller set: large roller for forehead, face, and neck, small roller for eyes and nose, jade Roller can promote blood flow and rids of fatiguing toxins, reduces puffiness, eye bags and dark circles around eyes, make skin more delicate and firm. ❦GUA SHA Massage Tool For the Whole body Caring: This guasha jade can works great on neck, face, backhand, wrist, shoulders, and foot. Offer you the most complete massage therapy. You can, therefore, enjoy a full, spa-like massage at the comfort of your home with minimal effort. 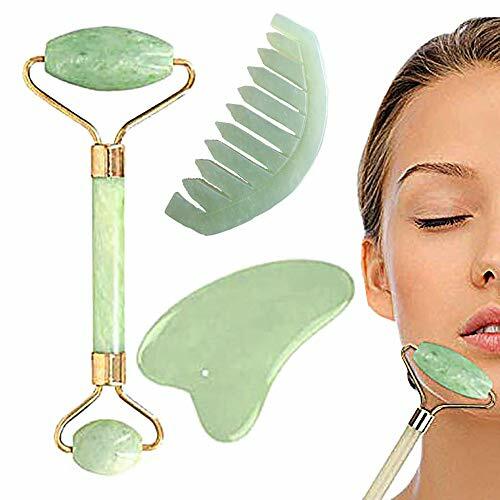 ❦Great Material: This jade facial roller made from 100% natural premium jade stone, which is beneficial minerals to Skin Beauty and Body Health, effectively relieves fatigue, improves skin texture and revitalizes skin. Long lasting, super easy to care, static free. ❦Perfect for All Skin Types: A visible improvement in skin tightening helps restore skin's youthful look. After using it, the skin appears younger and firmer, tightened and lifted. ❦BEST GIFTS & Money Back Guarantee：If you're not 100% happy with your purchase within 30 days, let us know and we'll refund your entire purchase price.